It’s been an interesting week here in El Paso. It all started with rain that started to fall on Sunday. (Rain is always exciting here.) But the wind was picking up and the temperatures were dropping. By mid-morning on Monday it had turned to snow. Big, clumpy snowflakes. 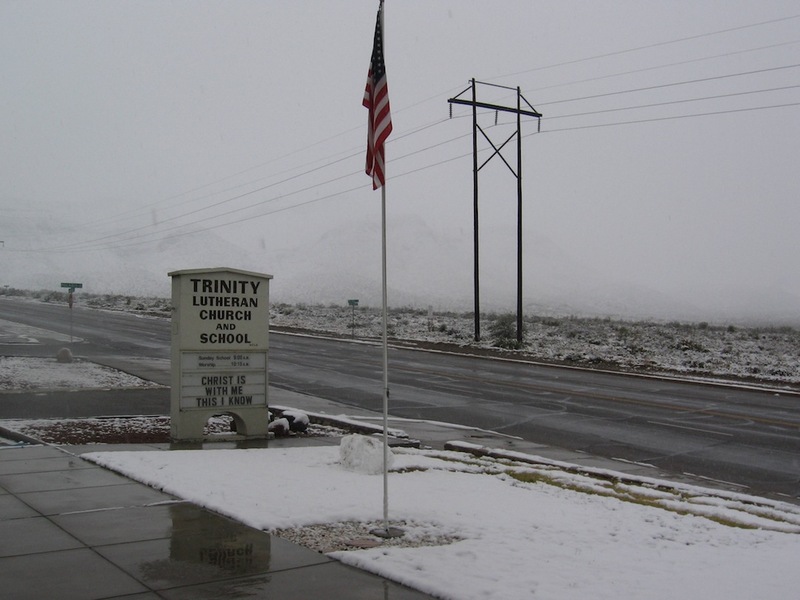 On Monday evening everyone was canceling activities (UTEP, the county courthouse, etc) By Tuesday morning we had couple inches on the ground. The public schools started two hours late. And even though the roads were all pretty good, we also waited until 10:00 to start. This actually isn’t our first snowfall of the year. It snowed a few weeks back and the mountains got a little white on top. It was on Tuesday that I also realized that the furnace didn’t seem to be working in church. Apparently, other people noticed it on Sunday, but hadn’t said anything. I tried to get someone to look at it, but that didn’t work out, and so our first midweek service was a bit chilly. What concerned me more than Wednesday’s service was the funeral scheduled for this morning. So last night we had a couple members at church working on the furnaces, but the units are outdoors on the roof, and it started snowing again around 7:30pm. They worked hard at it, but the snow kept them from finishing. Overnight, it laid down a nice layer of snow and ice that made this morning just as interesting. I left for church about 6:30. Since the car I’m currently driving parks in the driveway, the ice layer covered the car. I can’t remember the last time I have had to scrape ice off a windshield (2005, I suppose). Of course, I don’t even own an ice scraper or snow brush any more. Fortunately, a neighbor came to my rescue (who recently moved from Chicago). The roads were iced over and the sand trucks had not been out. It was 20 MPH all the way to church, but it was a little comical to watch the panic of people who really didn’t know how to drive on this stuff. The public schools delayed their start by two hours. But we had the funeral this morning at 9:30 and we had planned on having the school kids sing for the funeral. So we let parents know that we would start at 9:30. When I got to church I discovered that it was 50º in church, so I did what I could to get a little heat in there and then tried to find a way to get some ice off the sidewalk. Of course we have no shovels or salt or ice scrapers. So I found a hoe and dug up some sand from the back of church (we do have plenty of sand out here). The hoe worked surprisingly well, and I used a broom to sweep away the broken ice and then sprinkled sand to provide a little traction. The funeral seemed to go rather well, though a little cold. The funeral was for a 92-year-old WWII vet who survived the sinking of the troopship Leopoldville on Christmas Eve 1944 (look it up). He earned a purple heart for that and a second for being wounded in Korea. He was born in NE and raised in Minneapolis area (sound familiar?) but moved to El Paso to get away from the cold. Ironic that he was laid to rest on what should be the coldest day of the year, with snow still on the cacti.